The 13A Series may be mounted up to 90° from vertical and the zero shift may be corrected with the zero adjustment screw. 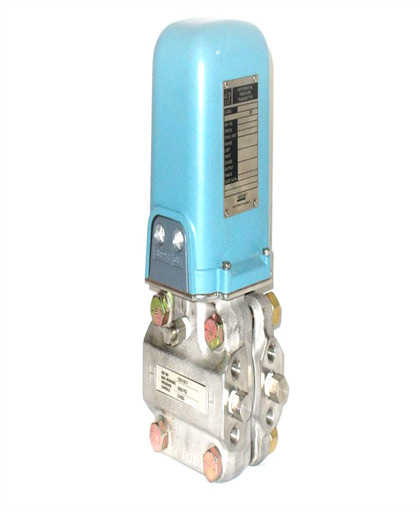 The Foxboro® brand Models 13A pneumatic d/p Cell transmitter’s measure differential pressure and transmit a standard pneumatic signal to receivers which may be several hundred meters or yards away. Foxboro d/p Cell Transmitters have been the standard of process industry ever since they were developed and introduced for sale more than 30 years ago. Many thousands of successful, trouble-free installations have demonstrated the exceptional dependability of these outstanding transmitters. 3-Valve, CS (Inst Conn 1,2,3,4,6) Anderson, Greenwood 3-Valve Bypass Manifold With Cadmium-Plated Carbon Steel Body. Uses Instrument Process Connections. 3-Valve, SS (Inst Conn 1,2,3,4,6) Anderson, Greenwood 3-Valve Bypass Manifold With AISI Type 316 Stainless Steel Body. Uses Instrument Process Connections. 3-Valve, SS (OS Cleaned) Anderson, Greenwood 3-Valve Bypass Manifold With AISI Type 316 Stainless Steel Body. Cleaned And Packaged For Oxygen Or Chlorine Service. Uses Instrument Process Connections. 3-Valve, SS (NACE Compliance) Anderson, Greenwood 3-Valve Bypass Manifold With AISI Type 316 Stainless Steel Body And Monel Wetted Parts. Refer To Foxboro For NACE Compliant Version. Uses Instrument Process Connections. 3-Valve, Monel (Inst Conn 1,2,3,4,6) Anderson, Greenwood 3-Valve Bypass Manifold With Monel Body And Wetted Parts. Uses Instrument Process Connections. 3-Valve, CS (Inst Conn Code = 0) Anderson, Greenwood 3-Valve Bypass Manifold With Cadmium-Plated Carbon Steel Body. Provides 1/2 NPT Connection On Process Side. 3-Valve, SS (Inst Conn Code = 0) Anderson, Greenwood 3-Valve Bypass Manifold With AISI Type 316 Stainless Steel Body. Provides 1/2 NPT Connections On Process Side. 3-Valve, SS (NACE , Inst Conn = 0) Anderson, Greenwood 3-Valve Bypass Manifold With AISI Type 316 Stainless Steel Body And Monel Wetted Parts. Refer To Foxboro For NACE Compliant Version. Provides 1/2 NPT Connections On Process Side. 3-Valve, SS (For Use w/IFOU) Anderson, Greenwood 3-Valve Bypass Manifold With AISI Type 316 Stainless Steel Body And Wetted Parts. Designed For Use With Integral Flow Orifice Assemblies. Carbon Steel (Inst Conn 1,2,3,4,6) Anderson, Greenwood Bypass Manifold With AGCO Mount For Nominal 2-Inch (DN 50) Pipe. Cadmium- Plated Carbon Steel Body And AISI Type 316 Stainless Steel Wetted Parts. Uses Instrument Process Connections. 316 ss (Inst Conn 1,2,3,4,6) Anderson, Greenwood Bypass Manifold With AGCO Mount For Nominal 2-Inch (DN 50) Pipe. AISI Type 316 Stainless Steel Body And Wetted Parts. Uses Instrument Process Connections. 316 ss (Oxygen Service Cleaned) Anderson, Greenwood Bypass Manifold With AGCO Mount For Nominal 2-Inch (DN 50) Pipe. AISI Type 316 Stainless Steel Body And Wetted Parts. Cleaned And Packaged For Oxygen Or Chlorine Service. Uses Instrument Process Connections. 316 ss Body; Monel Wetted Parts Anderson, Greenwood Bypass Manifold With AGCO Mount For Nominal 2-Inch (DN 50) Pipe. AISI Type 316 Stainless Steel Body And Monel Wetted Parts. Uses Instrument Process Connections. Refer To Foxboro For NACE Compliant Version. Carbon Steel (Inst Conn Code = 0) Anderson, Greenwood Bypass Manifold With AGCO Mount For Nominal 2-Inch (DN 50) Pipe. Cadmium- Plated Carbon Steel Body And AISI Type 316 Stainless Steel Wetted Parts. Provides 1/2 NPT Connection On Process Side. 316 ss (Inst Conn Code = 0) Anderson, Greenwood Bypass Manifold With AGCO Mount For Nominal 2-Inch (DN 50) Pipe. AISI Type 316 Stainless Steel Body And Wetted Parts. Provides 1/2 NPT Connection On Process Side. 316 ss Body; Monel Wetted Parts (Inst Conn Code=0) Anderson, Greenwood Bypass Manifold With AGCO Mount For Nominal 2-Inch (DN 50) Pipe. AISI Type 316 Stainless Steel Body And Monel Wetted Parts. Provides 1/2 NPT Connection On Process Side. Hydrogen Service Hydrogen Service: Transmitter Supplied With Gold-Plated Capsule To Reduce Hydrogen Penetration. Gold Plating Is Not To Be Used In Corrosion Protection. High Damping High Damping: Capsule Filled With High Viscosity Silicone Fluid (2200 Centistoke At 77 Degrees F). Provides Up To Four Times Normal Damping. High Process Temperature High Process Temperature: Glass-Reinforced ptfe Gaskets Fitted For Operation At Body Temperatures Up To 190 Degrees C (375 F). High Temperature Fill High Temperature Fill: Process Temperature Limits 0 And 300 Degrees C (32 And 580 F) For Positive Pressures; 0 And 200 Degrees C (32 And 400 F) For Vacuum Service. Transmitted Filled With DC 704 Or Equivalent. Low Temperature Fill Low Temperature Fill: Process Temperature Limits -60 And +80 Degrees C (-75 And +180 F). Transmitter Filled With FC 77 Fluorinert. Wide Temperature Fill Wide Temperature Fill: Process Temperature Limits -40 And +232 Degrees C (-40 And +450 F). Transmitter Filled With Wide Temperature Silicone. NACE Class II Bolting NACE Class II Bolting In Accordance With ASTM A193 GR B7M And A194 GR 2HM (Nuts). Optional Output Signal, 3-27 psi Optional Output Signal Of 3 To 27 psi (20.7 To 186 kPa). Reverse Output, 15-3 psi Optional Output Signal, Reverse, 15 To 3 psi (100 To 20 kPa, 1.0 To 0.2 bar or kg/cm2). Stainless Steel Body Bolting 17-4 PH Stainless Steel Bolting Through Body And Process Connections. Stainless Steel Mtg Bracket Bolting AISI Type 316 Stainless Steel Bolting Through Mounting Bracket. Test Tee Output Signal Test Tee. Viton A Gaskets Viton A Capsule Gasket And Force Bar Seal Gasket. ptfe Gaskets Corrosion Resistant ptfe Capsule Gasket And Force Bar Seal Gasket. Nuclear Service Cleaning Nuclear Service Cleaning - Transmitter Cleaned, Assembled, Calibrated And Packed In A Clean Room, Or Using Acceptable Alternate Procedures. Special Degreasing Special Degreasing - Transmitter Is Cleaned, Assembled, Calibrated, And Packed In A Clean Room, Or Using Acceptable Alternative Procedures. Oxygen Service Preparation Oxygen Service Preparation - Transmitter Cleaned, Assembled, Calibrated And Packed In A Clean Room, Or Using Acceptable Alternative Procedures. Capsules Fluorolube Filled. Monel Bolting K-Monel Studs And Nuts For Both Body And Process Connections. Lower Spans Span Adjustment As Low As 10 Inches Of Water, 2.5 kPa, Or 25 mbar. Tantalum Force Bar Seal Protection Tantalum Sheath Protection Over Cobalt-Nickel Force Bar Seal. Diaph, Other Wetted Parts Hast C Diaphragm And Wetted Capsule Parts, Hastelloy C276. Plus Monel Force Bar Diaphragm And Other Wetted Capsule Parts, Hastelloy C276 With Monel Force Bar. Diaph, Other Wetted Parts Monel Diaphragm And Other Wetted Capsule Parts, Monel. Plus Monel Force Bar Diaphragm And Other Wetted Capsule Parts, Monel With Monel Force Bar. Diaph, Duranickel,Other Parts Monel Diaphragm Duranickel And Other Wetted Parts, Monel. Plus Monel Force Bar Diaphragm Duranickel And Other Wetted Capsule Parts, Monel With Monel Force Bar. Chlorine Service Hastelloy C276 Capsule Filled With Fluorolube And Cleaned For Chlorine Service, 17-4 PH Stainless Steel Body Bolts, ptfe Gaskets, And Tantalum Sheath To Protect The Force Bar Diaphragm. Certificate Of Conformance The certificate states that the technical/quality portion of customers purchase order has been reviewed by quality engineering and that the instrument is in conformance with the customers technical purchase order requirements as well as Invensys Foxboro documentation. Customer purchase order must be forwarded to Order Management, B52-AB, the same time the order is entered. "Project Orders" a Cert "A" should be ordered"
Material Certificate Non-Specific - BS EN 10204 2.1 The certificate lists the instrument process wetted metallic parts by material, part number, and description of piece part. It also states that other evidence of conformance/compliance can be provide. Traceability to individual heat numbers is not available and the non-specific material certificates are not supplied. This certificate does not include resale options such as seals and bypass manifolds. CERT-C is signed and dated by the appropriate Quality Engineer or other qualified personnel. Certificate Of Cleaning The certificate states that the instrument has been specially degreased, cleaned for oxygen service, cleaned for chlorine service, etc., to minimize contaminants to the end users process, with special tagging and packaging per Invensys Foxboro cleaning standard CES 260. Note: The cleaning option (OS-W, OS-FC, CLS, etc.) must be added to the base instrument. PMI Certificat of Process Wetted Parts Certificate of Positive Material Identification. Provide PMI testing and certificate stating that the pressure wetted material(s) on this order are in conformance with the applicable ASTM standards. Testing provided in-house at Invensys/Foxboro facility using a non-destructive X-ray reflective analysis (XRF) analyzer (Bruker S1 Turbo). PMI Certificate for Pressure Containment Parts Certificate of Positive Material Identification. Provide PMI testing and certificate stating that the pressure containment material(s) on this order are in conformance with the applicable ASTM standards. Testing provided in-house at Invensys/Foxboro facility using a non-destructive X-ray reflective analysis (XRF) analyzer (Bruker S1 Turbo). ASME Weld Certificate his certificate states that all welds produced at Invensys/Foxboro on this order were performed in accordance with ASME Section IX of the Boiler Code. Supplemental Instrument Tag Supplemental Instrument Tag, 3.4 x 1.5 Inch (90 x 40 mm) Stainless Steel Fastened To Instrument With A Stainless Steel Wire. Markings Can Be Up To 10 Lines, 40 Characters Or Spaces Per Line. 0.0200 Inch (0.508 mm) Bore Diameter, 1/2 NPT 180° U-Bend Type Integral Flow Orifice Assembly. AISI Type 316 Stainless Steel (316 ss) Manifold Material, 1/2 NPT End Connection, And 0.0200 Inch (.508 mm) Bore Diameter. 0.0340 Inch (0.864 mm) Bore Diameter, 1/2 NPT 180° U-Bend Type Integral Flow Orifice Assembly. AISI Type 316 Stainless Steel (316 ss) Manifold Material, 1/2 NPT End Connection, And 0.0340 Inch (0.864 mm) Bore Diameter. 0.0595 Inch (1.511 mm) Bore Diameter, 1/2 NPT 180° U-Bend Type Integral Flow Orifice Assembly. AISI Type 316 Stainless Steel (316 ss) Manifold Material, 1/2 NPT End Connection, And 0.0595 Inch (1.511 mm) Bore Diameter. 0.0995 Inch (2.527 mm) Bore Diameter, 1/2 NPT 180° U-Bend Type Integral Flow Orifice Assembly. AISI Type 316 Stainless Steel (316 ss) Manifold Material, 1/2 NPT End Connection, And 0.0995 Inch (2.527 mm) Bore Diameter. 0.1590 Inch (4.039 mm) Bore Diameter, 1/2 NPT 180° U-Bend Type Integral Flow Orifice Assembly. AISI Type 316 Stainless Steel (316 ss) Manifold Material, 1/2 NPT End Connection, And 0.1590 Inch (4.039 mm) Bore Diameter. 0.2500 Inch (6.350 mm) Bore Diameter, 1/2 NPT 180° U-Bend Type Integral Flow Orifice Assembly. AISI Type 316 Stainless Steel (316 ss) Manifold Material, 1/2 NPT End Connection, And 0.2500 Inch (6.350 mm) Bore Diameter. 0.3500 Inch (8.890 mm) Bore Diameter, 1/2 NPT 180° U-Bend Type Integral Flow Orifice Assembly. AISI Type 316 Stainless Steel (316 ss) Manifold Material, 1/2 NPT End Connection, And 0.3500 Inch (8.890 mm) Bore Diameter. Nonstandard Bore Diameter, 1/2 NPT 180° U-Bend Type Integral Flow Orifice Assembly. AISI Type 316 Stainless Steel (316 ss) Manifold Material And 1/2 NPT End Connection. 0.0200 Inch (0.508 mm) Bore Diameter, Rc 1/2 180° U-Bend Type Integral Flow Orifice Assembly. AISI Type 316 Stainless Steel (316 ss) Manifold Material, Rc 1/2 End Connection, And 0.0200 Inch (0.508 mm) Bore Diameter. 0.0340 Inch (0.864 mm) Bore Diameter, Rc 1/2 180° U-Bend Type Integral Flow Orifice Assembly. AISI Type 316 Stainless Steel (316 ss) Manifold Material, Rc 1/2 End Connection, And 0.0340 Inch (0.864 mm) Bore Diameter. 0.0595 Inch (1.511 mm) Bore Diameter, Rc 1/2 180° U-Bend Type Integral Flow Orifice Assembly. AISI Type 316 Stainless Steel (316 ss) Manifold Material, Rc 1/2 End Connection, And 0.0595 Inch (1.511 mm) Bore Diameter. 0.0995 Inch (2.527 mm) Bore Diameter, Rc 1/2 180° U-Bend Type Integral Flow Orifice Assembly. AISI Type 316 Stainless Steel (316 ss) Manifold Material, Rc 1/2 End Connection, And 0.0995 Inch (2.527 mm) Bore Diameter. 0.1590 Inch (4.039 mm) Bore Diameter, Rc 1/2 180° U-Bend Type Integral Flow Orifice Assembly. AISI Type 316 Stainless Steel (316 ss) Manifold Material, Rc 1/2 End Connection, And 0.1590 Inch (4.039 mm) Bore Diameter. 0.2500 Inch (6.350 mm) Bore Diameter, Rc 1/2 180° U-Bend Type Integral Flow Orifice Assembly. AISI Type 316 Stainless Steel (316 ss) Manifold Material, Rc 1/2 End Connection, And 0.2500 Inch (6.350 mm) Bore Diameter. 0.3500 Inch (8.890 mm) Bore Diameter, Rc 1/2 180° U-Bend Type Integral Flow Orifice Assembly. AISI Type 316 Stainless Steel (316 ss) Manifold Material, Rc 1/2 End Connection, And 0.3500 Inch (8.890 mm) Bore Diameter. Nonstandard Bore Diameter, Rc 1/2 180° U-Bend Type Integral Flow Orifice Assembly. AISI Type 316 Stainless Steel (316 ss) Manifold Material And Rc 1/2 End Connection. 0.0200 Inch (0.508 mm) Bore, 316 ss Orifice Straight Through Type Integral Flow Orifice Assembly. AISI Type 316 Stainless Steel (316 ss) Manifold Material, 1/2 NPT End Connection, AISI Type 316 Stainless Steel (316 ss) Orifice, And 0.0200 Inch (.508 mm) Bore Diameter. 0.0340 Inch (0.864 mm) Bore, 316 ss Orifice Straight Through Type Integral Flow Orifice Assembly. AISI Type 316 Stainless Steel (316 ss) Manifold Material, 1/2 NPT End Connection, AISI Type 316 Stainless Steel (316 ss) Orifice, And 0.0340 Inch (.864 mm) Bore Diameter. 0.0595 Inch (1.511 mm) Bore, 316 ss Orifice Straight Through Type Integral Flow Orifice Assembly. AISI Type 316 Stainless Steel (316 ss) Manifold Material, 1/2 NPT End Connection, AISI Type 316 Stainless Steel (316 ss) Orifice, And 0.0595 Inch (1.511 mm) Bore Diameter. 0.0995 Inch (2.527 mm) Bore, 316 ss Orifice Straight Through Type Integral Flow Orifice Assembly. AISI Type 316 Stainless Steel (316 ss) Manifold Material, 1/2 NPT End Connection, AISI Type 316 Stainless Steel (316 ss) Orifice, And 0.0995 Inch (2.527 mm) Bore Diameter. 0.1590 Inch (4.039 mm) Bore, 316 ss Orifice Straight Through Type Integral Flow Orifice Assembly. AISI Type 316 Stainless Steel (316 ss) Manifold Material, 1/2 NPT End Connection, AISI Type 316 Stainless Steel (316 ss) Orifice, And 0.1590 Inch (4.039 mm) Bore Diameter. 0.2500 Inch (6.350 mm) Bore, 316 ss Orifice Straight Through Type Integral Flow Orifice Assembly. AISI Type 316 Stainless Steel (316 ss) Manifold Material, 1/2 NPT End Connection, AISI Type 316 Stainless Steel (316 ss) Orifice, And 0.2500 Inch (6.350 mm) Bore Diameter. 0.3500 Inch (8.890 mm) Bore, 316 ss Orifice Straight Through Type Integral Flow Orifice Assembly. AISI Type 316 Stainless Steel (316 ss) Manifold Material, 1/2 NPT End Connection, AISI Type 316 Stainless Steel (316 ss) Orifice, And 0.3500 Inch (8.890 mm) Bore Diameter. Nonstandard Bore Diameter, 316 ss Orifice Straight Through Type Integral Flow Orifice Assembly. AISI Type 316 Stainless Steel (316 ss) Manifold Material, 1/2 NPT End Connection, And AISI Type 316 Stainless Steel (316 ss) Orifice. 0.0200 Inch (0.508 mm) Bore, Monel Orifice Straight Through Type Integral Flow Orifice Assembly. AISI Type 316 Stainless Steel (316 ss) Manifold Material, 1/2 NPT End Connection, Monel Orifice, And 0.0200 Inch (.508 mm) Bore Diameter. 0.0340 Inch (0.864 mm) Bore, Monel Orifice Straight Through Type Integral Flow Orifice Assembly. AISI Type 316 Stainless Steel (316 ss) Manifold Material, 1/2 NPT End Connection, Monel Orifice, And 0.0340 Inch (.864 mm) Bore Diameter. 0.0595 Inch (1.511 mm) Bore, Monel Orifice Straight Through Type Integral Flow Orifice Assembly. AISI Type 316 Stainless Steel (316 ss) Manifold Material, 1/2 NPT End Connection, Monel Orifice, And 0.0595 Inch (1.511 mm) Bore Diameter. 0.0995 Inch (2.527 mm) Bore, Monel Orifice Straight Through Type Integral Flow Orifice Assembly. AISI Type 316 Stainless Steel (316 ss) Manifold Material, 1/2 NPT End Connection, Monel Orifice, And 0.0995 Inch (2.527 mm) Bore Diameter. 0.1590 Inch (4.039 mm) Bore, Monel Orifice Straight Through Type Integral Flow Orifice Assembly. AISI Type 316 Stainless Steel (316 ss) Manifold Material, 1/2 NPT End Connection, Monel Orifice, And 0.1590 Inch (4.039 mm) Bore Diameter. 0.2500 Inch (6.350 mm) Bore, Monel Orifice Straight Through Type Integral Flow Orifice Assembly. AISI Type 316 Stainless Steel (316 ss) Manifold Material, 1/2 NPT End Connection, Monel Orifice, And 0.2500 Inch (6.350 mm) Bore Diameter. 0.3500 Inch (8.890 mm) Bore, Monel Orifice Straight Through Type Integral Flow Orifice Assembly. AISI Type 316 Stainless Steel (316 ss) Manifold Material, 1/2 NPT End Connection, Monel Orifice, And 0.3500 Inch (8.890 mm) Bore Diameter. Nonstandard Bore Diameter, Monel Orifice Straight Through Type Integral Flow Orifice Assembly. AISI Type 316 Stainless Steel (316 ss) Manifold Material, 1/2 NPT End Connection, And Monel Orifice. 0.0200 Inch (0.508 mm) Bore, Hastelloy C Orifice Straight Through Type Integral Flow Orifice Assembly. AISI Type 316 Stainless Steel (316 ss) Manifold Material, 1/2 NPT End Connection, Hastelloy C Orifice, And 0.0200 Inch (.508 mm) Bore Diameter. 0.0340 Inch (0.864 mm) Bore, Hastelloy C Orifice Straight Through Type Integral Flow Orifice Assembly. AISI Type 316 Stainless Steel (316 ss) Manifold Material, 1/2 NPT End Connection, Hastelloy C Orifice, And 0.0340 Inch (.864 mm) Bore Diameter. 0.0595 Inch (1.511 mm) Bore, Hastelloy C Orifice Straight Through Type Integral Flow Orifice Assembly. AISI Type 316 Stainless Steel (316 ss) Manifold Material, 1/2 NPT End Connection, Hastelloy C Orifice, And 0.0595 Inch (1.511 mm) Bore Diameter. 0.0995 Inch (2.527 mm) Bore, Hastelloy C Orifice Straight Through Type Integral Flow Orifice Assembly. AISI Type 316 Stainless Steel (316 ss) Manifold Material, 1/2 NPT End Connection, Hastelloy C Orifice, And 0.0995 Inch (2.527 mm) Bore Diameter. 0.1590 Inch (4.039 mm) Bore, Hastelloy C Orifice Straight Through Type Integral Flow Orifice Assembly. AISI Type 316 Stainless Steel (316 ss) Manifold Material, 1/2 NPT End Connection, Hastelloy C Orifice, And 0.1590 Inch (4.039 mm) Bore Diameter. 0.2500 Inch (6.350 mm) Bore, Hastelloy C Orifice Straight Through Type Integral Flow Orifice Assembly. AISI Type 316 Stainless Steel (316 ss) Manifold Material, 1/2 NPT End Connection, Hastelloy C Orifice, And 0.2500 Inch (6.350 mm) Bore Diameter. 0.3500 Inch (8.890 mm) Bore, Hastelloy C Orifice Straight Through Type Integral Flow Orifice Assembly. AISI Type 316 Stainless Steel (316 ss) Manifold Material, 1/2 NPT End Connection, Hastelloy C Orifice, And 0.3500 Inch (8.890 mm) Bore Diameter. Nonstandard Bore Diameter, Hastelloy C Orifice Straight Through Type Integral Flow Orifice Assembly. AISI Type 316 Stainless Steel (316 ss) Manifold Material, 1/2 NPT End Connection, And Hastelloy C Orifice. Bellofram Adj Supply Regulator Bellofram Adjustable Supply Regulator: Two Outlet Taps, Maximum Supply Pressure 250 psi (1.7 MPa, 17 bar or kg/cm2), Reduced Pressure Range 0.5 To 60 psi (4 To 400 kPa, 0.4 To 4 bar or kg/cm2), 1/4 NPT Connection. Bellofram Fixed Press Filter Reg Bellofram Fixed Pressure Filter Regulator: Maximum Supply Pressure 150 psi (1 MPa, 10 bar or kg/cm2), Reduced Pressure Range 20 psi (140 kPa, 1.4 bar or kg/cm2), 1/4 NPT Connection. Moore Nullmatic M/41 Pressure Reg Moore Nullmatic Model 41 Pressure Regulator: Maximum Supply Pressure 150 psi (1 MPa, 10 bar or kg/cm2), Reduced Pressure Range 1 To 30 psi (7 To 200 kPa, 0.07 To 2.1 bar or kg/cm2), 1/8 NPT Connection. Bellofram Airdron 20B Adj Press Reg Bellofram Airdron Type 20B Adjustable Pressure Regulator: Maximum Supply Pressure 250 psi (1.7 MPa, 17 bar or kg/cm2), Reduced Pressure Range 2 To 150 psi (14 To 1000 kPa, 0.14 To 10 bar or kg/cm2), 1/4 NPT Connection. Moore Type 63BD Diff Pressure Reg Moore Type 63BD Differential Pressure Regulator: Maximum Supply Pressure 100 psi (700 kPa, 7 bar or kg/cm2), Differential Pressure 12 Inches (3 kPa, 100 mbar) Water, 1/4 NPT Connection. Moore Type 62V Diff Press Reg (Air) Moore Type 62V Differential Pressure Regulator, Bleed Type (Air): Maximum Supply Pressure 100 psi (700 kPa, 7 bar or kg/cm2), Differential Pressure 1.5 psi (10 kPa, 100 mbar), 1/4 NPT Connection. Moore 63BD Diff Press Reg (Liq-Gas) Moore Type 63BD Differential Pressure Regulator, Non-Bleed Type (Liquid-Gas): Maximum Supply Pressure 250 psi (1.7 MPa, 17 bar or kg/cm2), Differential Pressure 3 psi (20 kPa, 200 mbar), 1/4 NPT Connection. Air Filter Regulator Set Air Filter Regulator Set: Consists Of Fisher Type 67 (B0110XS) Or Bellofram (B0123HF) Adjustable Supply Regulator (Two Outlet Taps; Maximum Supply Pressure 250 psi (1.7 MPa, 17 bar or kg/cm2); Reduced Pressure Range 0.5 To 60 psi (4 To 400 kPa, 0.4 To 4 bar or kg/cm2); 1/4 NPT Conn) For Flush Or Surface Mounting And Foxboro Air Filter (B0102ZT; Maximum Pressure 150 psi (1 MPa, 10 bar or kg/cm2); 1/4 NPT Connection). Bellofram Adj Supply Reg And Filter Bellofram Adjustable Supply Regulator And Filter: Two Outlet Taps. Air Filter W/Ind Gauge 0-2 kg/cm2 Air Filter Set With Indicating Gauge: Consists Of Fisher Type 67 (B0110XS) Or Bellofram (B0123HF) Adjustable Supply Regulator [Two Outlet Taps; Maximum Supply Pressure 250 psi (1.7 MPa, 17 bar or kg/cm2); Reduced Pressure Range 0.5 To 60 psi (4 To 400 kPa, 0.4 To 4 bar or kg/cm2); 1/4 NPT Connection] For Flush Or Surface Mounting, Foxboro Air Filter [B0102ZT: Maximum Supply Pressure 150 psi (1 MPa, 10 bar or kg/cm2); 1/4 NPT Connection], Piping, And 0-2 kg/cm2 Gauge. Air Filter W/Ind Gauge 0-30 psi Air Filter Set With Indicating Gauge: Consists Of Fisher Type 67 (B0110XS) Or Bellofram (B0123HF) Adjustable Supply Regulator [Two Outlet Taps; Maximum Supply Pressure 250 psi (1.7 MPa, 17 bar or kg/cm2); Reduced Pressure Range 0.5 To 60 psi (4 to 400 kPa, 0.4 To 4 bar or kg/cm2); 1/4 NPT Connection] For Flush Or Surface Mounting, Foxboro Air Filter [B0102ZT; Maximum Maximum Supply Pressure 150 psi (1 MPa, 10 bar or kg/cm2); 1/4 NPT Connection], Piping, And 0 To 30 psi Gauge. Tool Set For Controllers Tool Set For Controllers. Fitting, Compression Fitting, Compression, 1/4 x 1/8 NPT Male. Fitting, Union Fitting, Union, 1/4 NPT Female x 1/8 NPT Male. 2" Gauge, 0-30, 1/4 NPT Bottom 2-Inch Model MH Green Band Supply Pressure Gauge, Range 0-30 psi, 1/4 NPT Bottom Connection. 2" Gauge, 0-30, 1/4 NPT Back 2-Inch Model MH Green Band Supply Pressure Gauge, Range 0-30 psi, 1/4 NPT Back Connection. 2" Gauge, 0-30, 1/4 NPT Left Side 2-Inch Model MH Green Band Supply Pressure Gauge, Range 0-30 psi, 1/4 NPT Left Side Connection. 2" Gauge, 0-30, 1/8 NPT Left Side 2-Inch Model MH Supply Pressure Gauge, Range 0-30 psi, 1/8 NPT Left Side Connection. 2" Gauge, 0-30, 1/4 NPT Left Side 2-Inch Model MH Supply Pressure Gauge, Range 0-30 psi, 1/4 NPT Left Side Connection. 2" Gauge, 0-30, 1/8 NPT Bottom 2-Inch Model MH Supply Pressure Gauge, Range 0-30 psi, 1/8 NPT Bottom Connection. 2" Gauge, 0-30, 1/4 NPT Bottom 2-Inch Model MH Supply Pressure Gauge, Range 0-30 psi, 1/4 NPT Bottom Connection. 2" Gauge, 0-30, 1/8 NPT Back 2-Inch Model MH Supply Pressure Gauge, Range 0-30 psi, 1/8 NPT Back Connection. 2" Gauge, 0-30, 1/4 NPT Back 2-Inch Model MH Supply Pressure Gauge, Range 0-30 psi, 1/4 NPT Back Connection. 2" Gauge, 0-30, 1/8 NPT Back, Flush 2-Inch Model MH Supply Pressure Gauge, Range 0-30 psi, 1/8 NPT Back Connection, Flush Mounted. Brass Reducer Brass Reducer, 1/8 NPT Female x 1/4 NPT Male. 3.5" Gauge, Custom Dial, Stem Mounting 3.5-Inch Model MR Indicating Receiver Gauge With Custom Dial, Weather Resistant, 1/4 NPT External Thread Back Connection, Stem Mounting. 3.5" Gauge, Custom Dial, Flush Mounting 3.5-Inch Model MR Indicating Receiver Gauge With Custom Dial, Weather Resistant, 1/4 NPT External Thread Back Connection, Flush Mounting. 3.5" Gauge,0-100 Uniform/0-10 Sq Rt, Stem Mtg 3.5-Inch Model MR Indicating Receiver Gauge, Dial Range 0 To 100 Uniform Or 0 To 10 Square Root (Dual Scale), Weather Resistant, 1/4 NPT External Thread Back Connection, Stem Mounting. 3.5" Gauge,0-100 Uniform/0-10 Sq Rt, Flush Mtg 3.5-Inch Model MR Indicating Receiver Gauge, Dial Range 0 To 100 Uniform Or 0 To 10 Square Root (Dual Scale), Weather Resistant, 1/4 NPT External Thread Back Connection, Flush Mounting. Air Supply Set Air Supply Set - Integrally Mounted Adjustable Regulator And 30 psi Gauge. Fixed Regulator Integral Air Supply Set With Fixed Pressure Regulator. Fixed Regulator And Gauge Integral Air Supply Set With Fixed Pressure Regulator And Green Band Gauge. Adjustable Regulator And Gauge Integral Air Supply Set With Adjustable Pressure Regulator And Green Band Gauge. Fixed Regulator, /P Integral Air Supply Set With Fixed Pressure Regulator, And With Plastic (Irradiated Poly- olefin) Covered Tubing. Fixed Regulator And Gauge, /P Integral Air Supply Set With Fixed Pressure Regulator And Green Band Gauge, And With Plastic (Irradiated Polyolefin) Covered Tubing. Adjustable Regulator And Gauge, /P Integral Air Supply Set With Adjustable Pressure Regulator And Green Band Gauge, And With Plastic (Irradiated Polyolefin) Covered Tubing.